Still inflicted by ‘Potters Block’….I have stumbled upon an alternative outlet for my creativity. Appealingly, this activity traditionally takes place in front of the fire, whilst wearing slippers and drinking tea. Considering the chilly turn in the weather it is certainly more preferable right now to a damp, drafty shed. This creation was meant to be a Christmas pressie, but when I finished it today I was laughing so much I couldn’t keep it to myself. 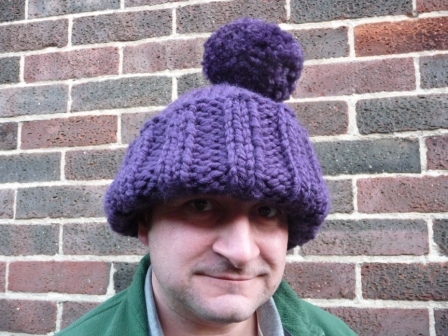 Also, where on earth would I hide such an enormous hat!…..I’m not sure it would fit under the bed! I followed the pattern exactly, even managing my first ever ‘Purl’. 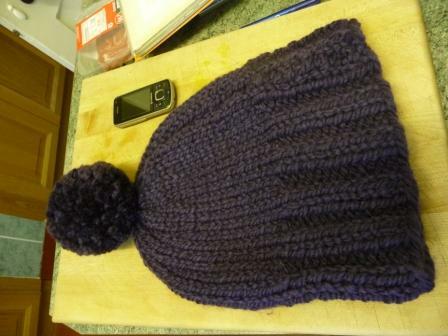 It is technically sound, which I am very impressed by and the pompom is beautiful (although also maybe a bit large). Perhaps I used the wrong chunky wool, maybe the pattern was an April Fool, but one thing is for sure….I have created a monster! 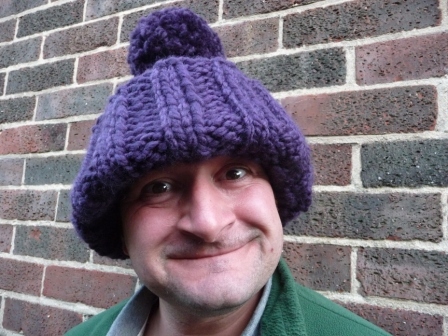 If the pompom swings, it is likely to pull poor Julian off centre….“Oh Dear Sir, you seem to have fallen over, are you ok……Oh yes, I’m fine……it’s just my rather enormous hat!”. Shall I been mean and make him wear it?……..not when out with me obviously. 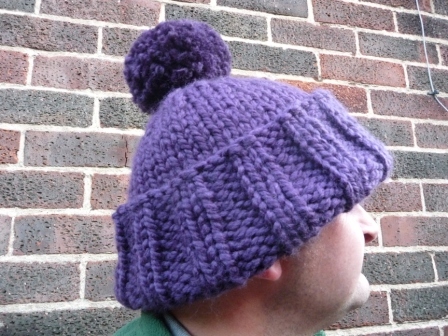 Or I could cut make a hole in either side and make a fetching tea cosy. Actually, does anyone have a tea pot big enough? The phone give you some idea of the scale of this knitted wonder.